An infrared thermal imaging solution offering continuous, short-wavelength, 24/7 temperature monitoring for steam reformer and Ethylene cracker tube furnaces. NIR Borescope (NIR-B) 3XR is a radiometric infrared imaging camera optimised for continuous temperature measurements in steam reformer and cracker tube furnaces. Using the proven technology of AMETEK Land’s advanced NIR thermal imager, NIR-B 3XR offers highly accurate measurements of high temperatures, enabling process control optimisation, energy efficiency savings and prolonging the lifetime of the reformer tubes. Producing real-time thermal data from 307,200 points across the high-resolution visual image, the imager connects to a PC running dedicated LIPS NIR processing software for accurate data analysis and long-term trending. 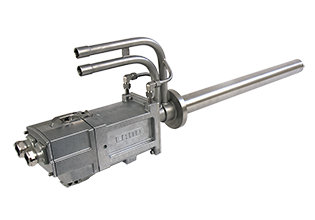 By providing a wide temperature measurement range of 600 – 1800 °C (1112 – 3272 oF), NIR-B 3XR provides the hydrocarbon processing industry a highly flexible imaging solution for the unique process conditions of reformer and cracker tube furnaces. By using a short wavelength to minimise emissivity errors, accurate, continuous temperature profiling is assured, for maximum furnace control. Uneven heating can be visualised and, during start-up phases, any burners not operating correctly can be clearly identified. The single temperature range and wide dynamic range imaging technology are ideal for applications with high-differential temperatures in the field-of-view. High-resolution imaging and a 90° field-of-view allows multiple reformer or cracker tubes to be monitored simultaneously. The NIR-B 3XR is AMETEK Land’s optimised solution for thermal imaging in reformer and cracker tube furnaces.